Buy Sophie Atherton a Coffee. ko-fi.com/sophwrites - Ko-fi ❤️ Where creators get paid by fans, with a 'Buy Me a Coffee' button. Sophie Atherton is a freelance journalist and was the first woman in the UK to be accredited as a beer sommelier. Her work appears regularly in the UK national press and various magazines - including trade publication The Morning Advertiser in which she writes a monthly column. Welcome to my Ko-fi Page. 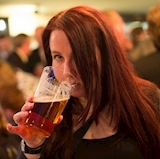 If you enjoy my beer writing, especially on A FemAle View, please consider 'buying me a pint'. Writing isn't the most lucrative of jobs so it's a genuine case of every little helps. Thanks! Secured Payments. Support goes to Sophie Atherton's account. Upgrade Sophie Atherton to a yearly Gold Membership with a one-time payment.